This 3 days Congo Eastern Lowland Gorilla Trek is a memorable short tour for the enthusiast who long’s for the world’s most unique and authentic primate encounters but is short on time. This tour is a perfect choice for visitors who want to see Eastern lowland gorillas which are less than 300 in numbers left. 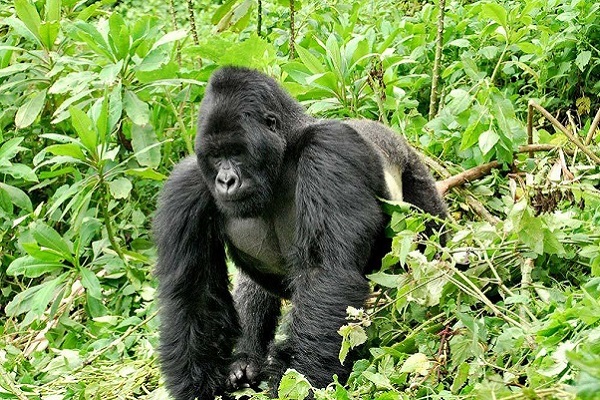 We will take you straight to Kahuzi-Biega National Park to trek the largest Gorilla subspecies on the planet the Eastern Lowland Gorilla and then the following day be back in Rwanda with the stunning Lake Kivu as the backdrop to your adventure this will be a memorable experience that not too many people have done. Kahuzi-Biega national park is one of DR Congo’s major tourist destinations. Kahuzi-Biega national park is the only home to the Eastern lowland gorillas. 1 x Visa Permit DR Congo. 1 Night Single accommodation One & Only. Full board. 1 Night suite accommodation at Orchid’s Safari Club Hotel Bukavu, DR Congo. FullBoard. 1 x Farewell Dinner in Kigali on final day. Welcome to Kigali, Rwanda. We will be waiting for you at the arrival hall at Kigali International Airport introduce you to your driver guide,provide you with a detailed briefing before we head off to your Hotel for an overnight. Dinner and Overnight at Onomo Hotel, Ubumwe Glande Hotel or Kigali Marriott Hotel. After your breakfast, embark on your vehicle for a 6 hour scenic transfer to Bukavu, DR Congo via Kivu Lodge for lunch and room inspection before proceeding to Bukavu border through Nyungwe Forest National Park. After the Lodge inspection, you will proceed to the boarder and on arrival, you will be met and assisted by our representative in Congo, for Visa and later embark on your vehicle for your transfer to your accommodation. Check in for a refreshen up and relax with the Hotel facilities. Dinner and overnight at Orchid Safari Club Hotel. National Park stabilize then grow its populations. Eastern Lowland Gorillas are thought to have separated from Mountain Gorillas around 200,000 years ago. Whilst similar the Eastern Lowland Gorilla is even larger with the biggest males weighing up to 250 kilograms. They are also not as shy as the Mountain Gorillas who you should not look in the eye too long or they perceive a threat. The Eastern’s don’t mind if you look at them, I guess they don’t feel very threatened as they are twice our mass. On this day once you locate the Lowland Gorillas you get to spend an hour with the world’s largest primate and his adorable family before we take you across the border which is only 1 hour away back to Rwanda. You will be transferred back to Kigali for a freshen up at Flame Tree Village and be ready for a farewell dinner and market update with Mr. Victor and Moreen at one of the best Khana Khazana Indian Restaurant before your transfer to Kigali International Airport for your late flight out. Africa Holiday Safaris wishes you a fond farewell, safe onward travels and great memories that will be with you long after you return home.